As an emblem of the driving force behind desert Aboriginal art, the photograph by Ikuntji Artists’ Roseranna Larry, winner of the 2017 Desart Photography Prize, is eloquent. In whatever medium they are working, artists are making their art primarily for their children, “for our next generations”: this is the most repeated statement about what motivates them, as simple as it is profound. 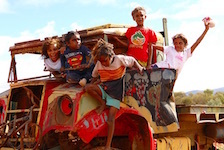 KIERAN FINNANE reports on the annual Desert Mob.